TrueCrypt is a is sort of discontinued, but it was once a widely available freeware utility used for on-the-fly encryption (OTFE). It can create a virtual encrypted disk within a file or encrypt a partition or (under Microsoft Windows except Windows 8 with GPT) the entire storage device (pre-boot authentication). On 28 May 2014, the TrueCrypt website announced that the project was no longer maintained and recommended users to find alternate solutions. Since that announcement was made Thomas Bruderer and Joseph Doekbrijder have stepped forward with plans to revive the project through the truecrypt.ch site, which is offering downloads of TrueCrypt 7.1a – which can encrypt and decrypt data, and was the latest version prior to 7.2. 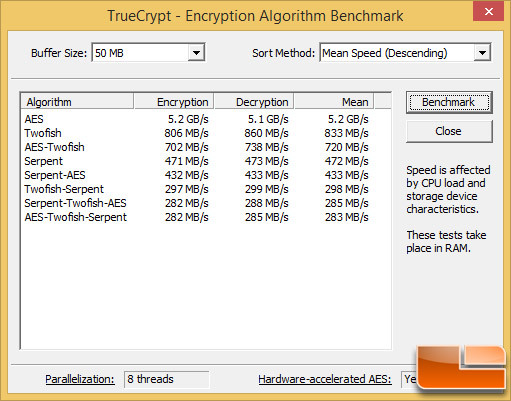 We are using the benchmark built-in TrueCrypt 7.1a with default settings to figure out the mean AES speed for each of the processors being tested with a 50MB buffer size. 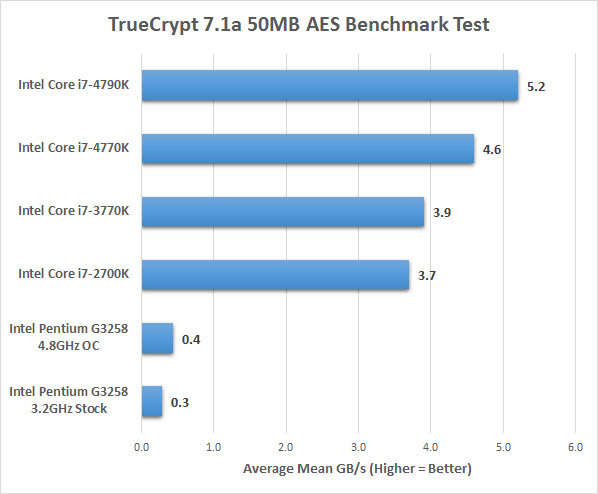 Benchmark Results: As you can see the Intel Pentium G3258 didn’t do too hot on TrueCrypt when it came to the Advanced Encryption Standard (AES) benchmark test. This is because the Intel Pentium G3258 does not support the Advanced Encryption Standard New Instruction set (AES-NI). AES-NI are a set of instructions that enable fast and secure data encryption and decryption, so if you run applications that perform bulk encryption/decryption, authentication, random number generation, and authenticated encryption you’ll want to be sure to invest in a processor that has AES-NI support.